These programs use algorithms to determine the beginning, end and extension of a file without relying on data that used to be contained in the file system. This works for only un-fragmented files (stored on the disk as a continuous set of file data clusters). The file organizing functions allow you to create folders based on information contained inside the file and outside the file system it is stored in, and move / copy the file to these folders. This is useful when you detected and recovered files by signatures, but recovered files have abstract names. The file organizer function is primarily used to open files of a chosen extension, look at data contained within that file, create a folder structure that matches the data contained within the file and move / copy the file to that folder. Its primary function is to organize / rename files after a catastrophic data loss. By using the file organizer, you can quickly and easily organize these files into folders that you can recognize and use your recovered files. An example of the tremendous power of this data can be illustrated by the following scenario. You had a total file system failure and had your files recovered by signature. You now have your data stored in folders containing tens of thousands of JPG files, and another folder with all your MP3 files, and another folder with all your M4A files. 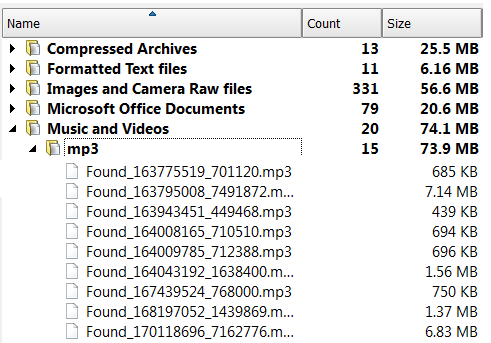 These files have names like file3124.MP3 or file1556 M4A. By using the file organizer, you could select your folder containing all the MP3 files, choose your re-organizing options and then recover files to the specified folder's structure. Just because a file has an extension of JPG or MP3, does not ensure it contains the information the program needs to extract in order to rename it. If this information is not present, the program will consider the file unrenamable. If the required option is chosen, the unrenamable files will be moved to a specific folder chosen to house all the files that are unrenamable.